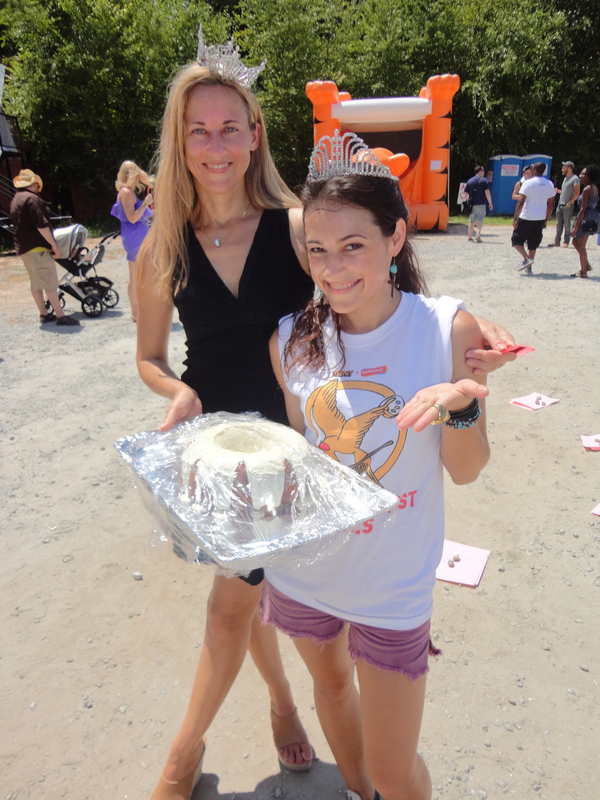 These weeks were crazy with the countdown to the Starving Artist Games on Saturday! On Tuesday, I was putting together the finishing touches on the event making sure everything was in our budget and that there was nothing missing from the activities to the restrooms. There is a lot of behind the scenes action that is going into this event. The location itself was a hassle just since it takes many permits and licenses to gain access to a site. And thank the lord for volunteers!! Events like these would never be possible without the help from the locals. 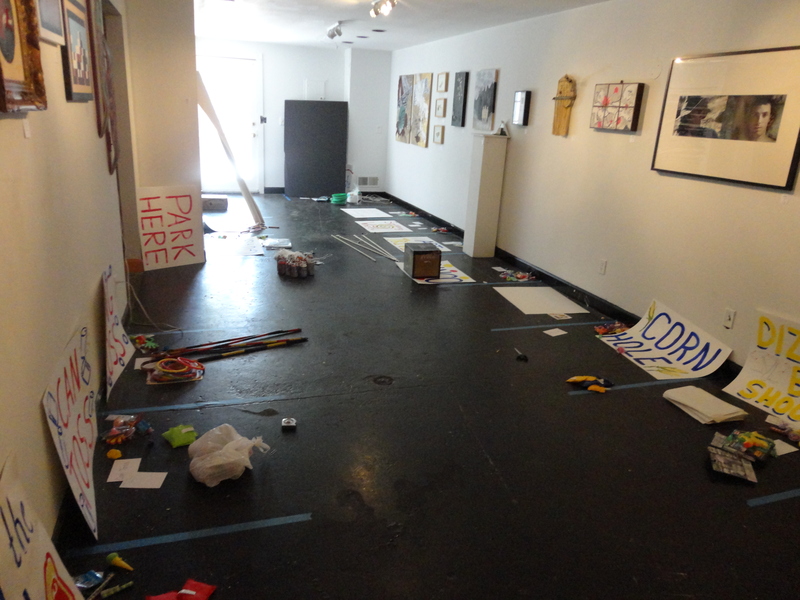 I came in again on Thursday to help create the games for the event at MINT gallery. MINT gallery is the co-sponsor of this event. We are hoping to total around $3,000 revenue form the event which will help these organizations out tremendously. I had to do some major shopping for supplies, some of the supplies was for the heavy metal cake walk! I walked out of Target with 8 boxes of cake and even more tubs of icing. The lady in the checkout line probably thought I was crazy…haha! On Saturday, the day started really early. At 10am I arrived, but it seemed as if the day had started way earlier! The event was hosted at the intersection of Irwin and Krog, a nice large plot of flat gravel. It was probably about 95 degrees the entire time of setting up, and we went through many cups of water. One of the volunteers happened to be Belinda, a recent Agnes Scott grad who majored in studio art! It was so nice to see a familiar face! She was running the Bingo booth, which I won twice at and got a prize of art! (pictures coming soon!) I was in charge of one of the fun games for kids, it was nice to sit back and watch people enjoy an event that you know you helped support and create. 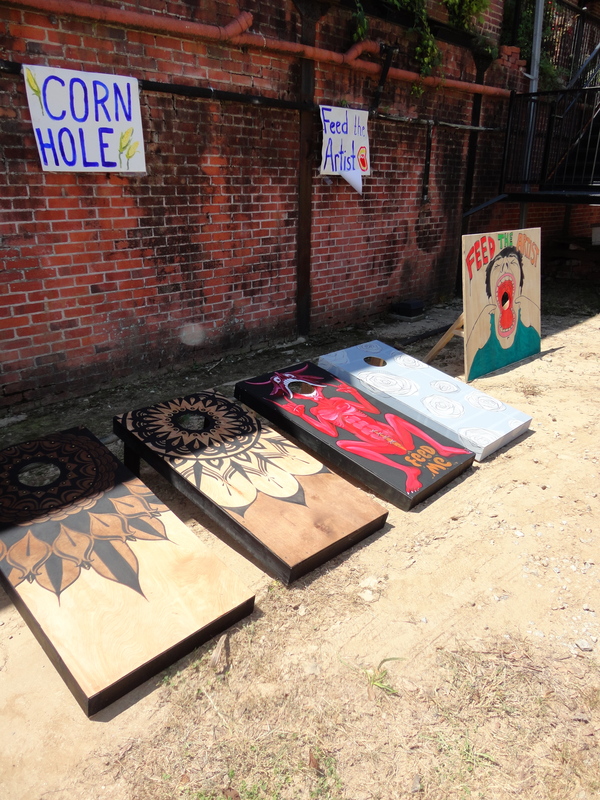 From beginning to end, the Starving Artist Games truly were a success! Preparing for the Artist Games!! 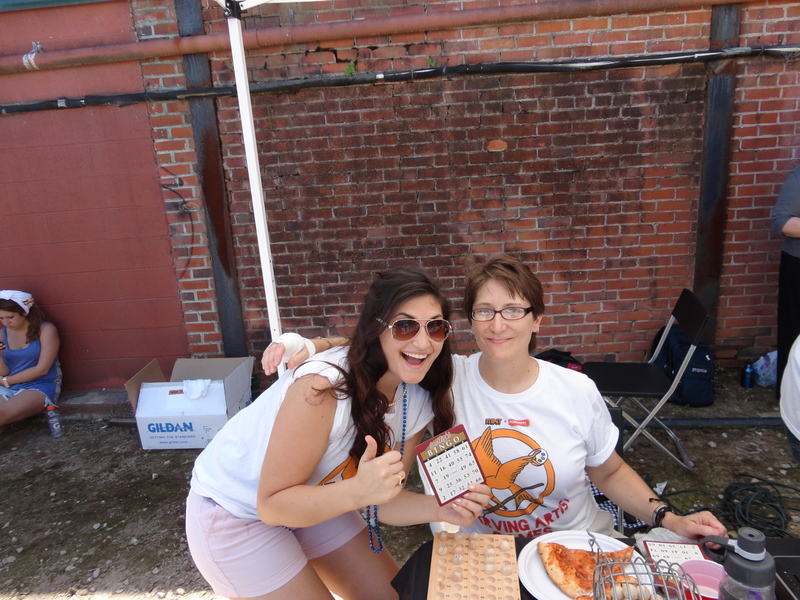 Belinda and I after I won BINGO for the second time! 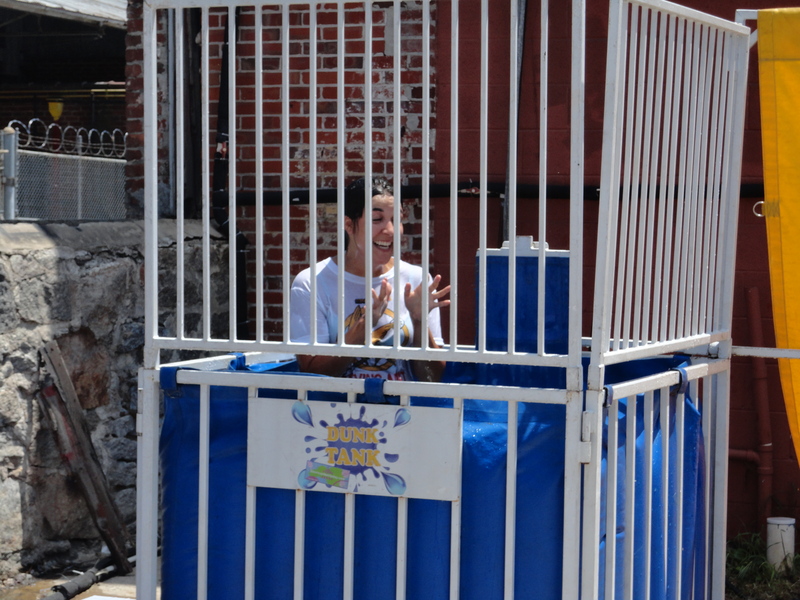 Susannah, my internship sponsor, getting dunked in the splash tank! 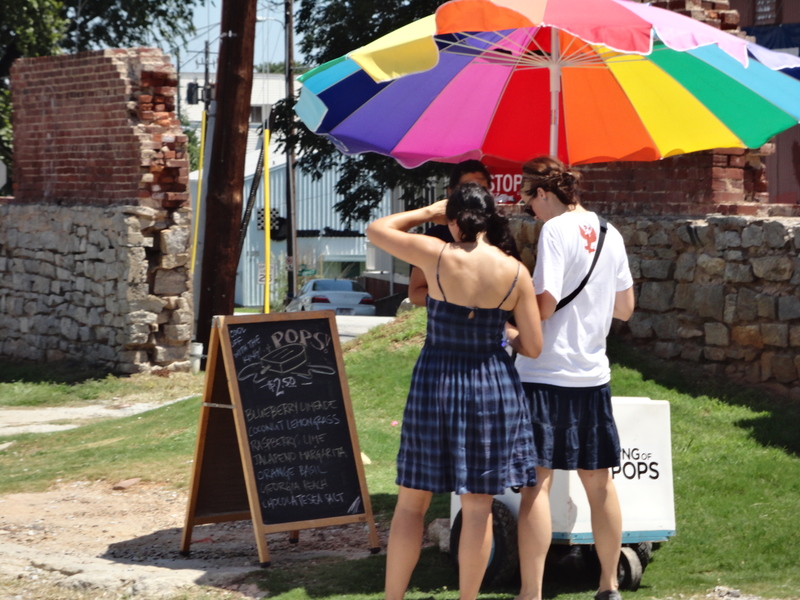 King of Pops even attended! Yum!! This week I have become more involved with the gallery scene for the September Fundraiser. The Granite Room will be the event site, a very cool and unique gallery space in Atlanta. I think that Burnaway is trying to redefine the art scene in Atlanta by showing people out there, that they can find some of the best spaces in Atlanta. I helped her make an outline and blueprint of the gallery space: where the art will be placed and where people will need room to stand around, chat, and drink wine (which most everyone will be doing the entire night). It is amazing what little details are so important to planning an event outside of the artwork itself. There are the necessities like bathrooms, parking, bar space, and stage space, which can take up a lot of space! On the blueprint pictured above the yellow represents projections on the outside of the building and on interesting curvaceous spaces throughout. The pink highlighter shows actual gallery hanging space and the blue/ green is entertainment space where the stage, food trucks, and bar will be hosted. I feel like everything is coming together so fast, but in hindsight, there is still SO much more to do in the upcoming months! 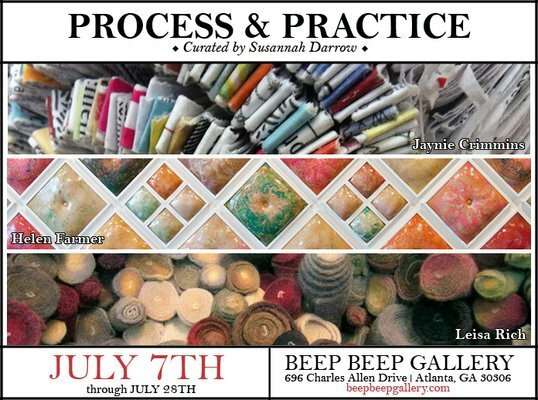 This week was focused on the upcoming event “Process and Practice” curated by Sue herself. It is in Beep Beep Gallery till Jult 28th. The opening was a lot of fun. The turn out was incredible! People could barely be contained inside and the crowd ended up spilling out onto the street. The focus of this exhibit was to feature three local female artists (Jaynie Crimmins (Atlanta), Helen Farmer (Greenville), and Leisa Rich (Atlanta)). These artists have used their talent to create exquisite and captivating pieces for the viewer. They try to move towards practice and process to express their art and not just subject it to a craft. Everything is handmade into individual sculptural works of art. “Jaynie Crimmins uses household items that are molded into forms, abstracting their initial applications as a means of changing the context of how these materials are used in her own quotidian activities. Helen Farmer uses the traditional platform of printmaking to create works that are deceptively sculptural, appearing more like glazed ceramic molds than the thin, sheer prints that are layered into the pieces. I really enjoyed attending a completely female dominated show. From the curator to the artists, this show turned out to be amazing, proving that women can take traditional materials and spin them into creative works of art. These weeks are combined because I was working on one huge project (mostly from home) the whole time. 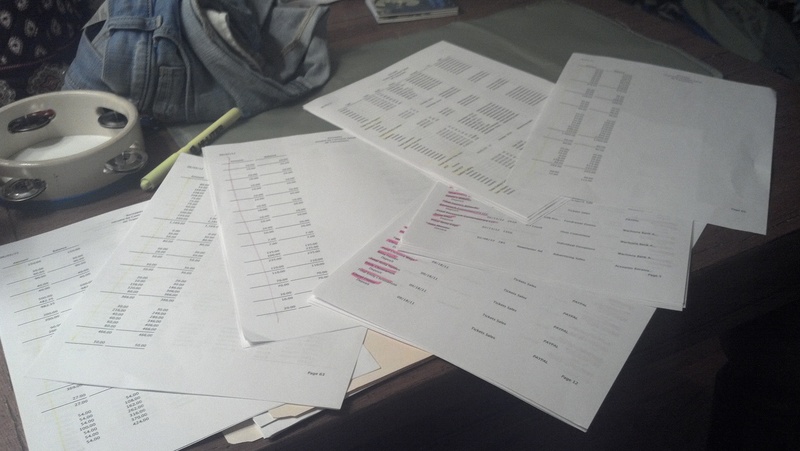 During week #6 I was given an 80 page spreadsheet with information on it for the donor database. I am starting to realize how much is in this database I am creating. There is literally every person’s information from every past event that either bought a ticket and/or bought a piece of art. It is extremely important to the organization that we know who contributes what to us. I think this is a great thing about Burnaway. They love to acknowledge the people who help them keep the foundation alive. Today I was focused on two things: major art event dates, and major historical Atlanta events. I also finished up and polished up the Burnaway site’s staff page. 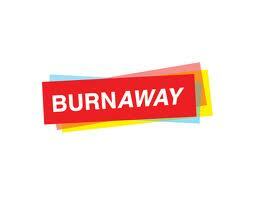 Burnaway wants to ensure that it’s events in the next year do not conflict with any other art organizations events. The main organizations I focused on are ACP, The Carlos Museum, Wonderroot, The High, MOCA, and The Contemporary. Most of these places have a fall and spring event fundraiser, much like Burnaway. I am starting to see a pattern in how these are organizations design their fundraisers. I found out when their events are as well so that Burnaway might get first dibs on event locations and attention from the art community. All business here :). Next there was a need to start researching major Atlanta events for the Fall Fundraiser, Burnaway’s biggest fundraiser. The theme will be centralized around the rebirth of Atlanta. It was originally the burning of Atlanta. I am thinking of centralizing my research around big events like the Olympics, civil rights, gay rights, the Braves, and Coca-Cola, etc. During lunch we met with some of the Starving Artist committee members and planned out more of the event. Every time we meet the conversation gets more and more exciting. We are just concerned that because we have not reserved a location, but I’m sure we will find one. Everything falls into place one the location is reserved. Can’t wait till next week!! Today at Burnaway was busy even with the rain making everyone tired. I first helped update the Burnaway site online with WordPress. I updated contacts and their events page. The contacts had people that no longer worked for them so it was in dire need of an update. The events page was completely blank, so I went and compiled a list of all major events from 2009. 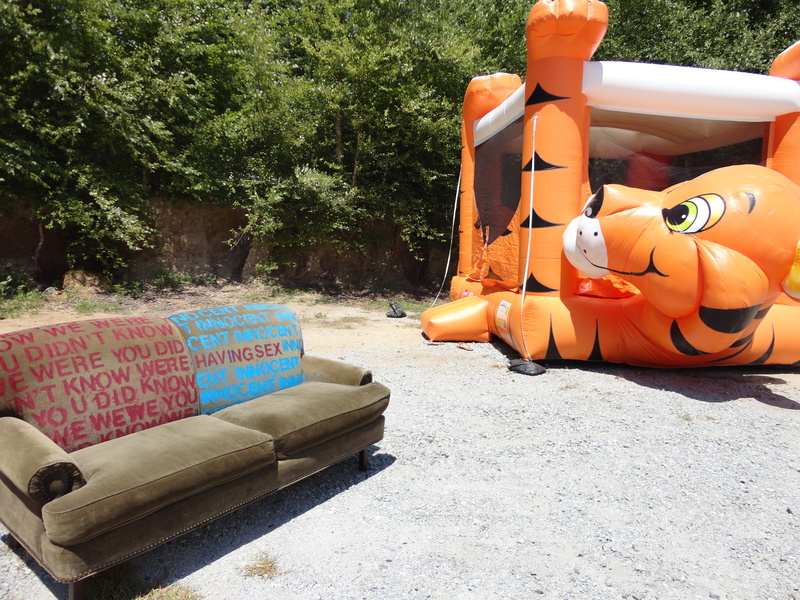 This was fun because I was able to find out more about their past event and more about what type of events Burnaway creates for the Atlanta art community. After that, i was with one of the directors talking about the Starving Artist Olympics and what other events should be added to the carnival. She was a real joy to talk to. Apparently she had a show at Agnes Scott after Collage this year. Later on in the day I worked more on the Donor Database, trying to update the document with about 70 pages of information…it’s a lot but I’m sure I will be able to do it. I added a picture from the hallway by the office. I thought it was really cool and unique. Maybe I will add a video tour of the Goat farm on my next blog post!! Today I was in charge of creating a list of arts centers OTP (outside of the perimeter). Burnaway is really centered within the metro Atlanta scene and wants to branch out to potential members and donor who might not know about Burnaway. Hopefully these people and centers will begin to promote our organization. It was really interesting looking at how many arts centers there really are. 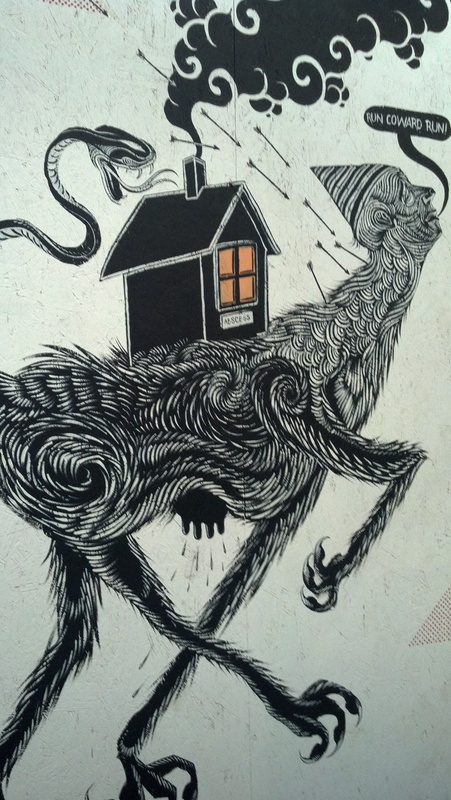 Cities outside of the metro Atlanta art scene are still very much alive in the arts. I had a very narrow perspective of the arts OTP before I began researching and compiling information. My next task was to update the college database. I made sure every bit of Agnes Scott information was on there, of course. I added a few more arts schools and made sure all of the contact and gallery information was correct. When I was finished with that, I did some more administrative work with Sue like writing checks and running errands for the board meeting. The day was busy but always fun!! Today I did a lot to help Sue come up with ideas for the closely approaching Starving Artists Olympics. This is going to be a fun event to help promote Atlanta artists and get the community involved. It will start with the lighting and running of the torch with a procession that leads into the main event. The main event will be composed of teams that will have to complete a set of relays and races that are timed. They will be judges on time, spirit, and style. Afterwards will be a carnival for children and adults alike. We have come up with so many games and activities that it is almost overwhelming. I went to lunch with Sue and her event coordinator to firm up the details. It feels like I am behind the scenes on creating this fun event. I am getting so much insight on creating an event like this. The second major event we are organizing is the annual fall fundraiser. There is a planning committee tonight to help decide tasks and set dates and deadlines. I am excited to join this group of event planners and help organize and coordinate their biggest fundraiser of the year. I have already created a spreadsheet that breaks down the weeks up until the actual event, which will take place in September (it is a sort of countdown). This is only my second day working here and I have fully embraced all the knowledge I am gaining! Today I arrived at the Goat Farm around 10am. Most of the day I worked on compiling information onto an Excel spreadsheet for Burnaway. This spreadsheet will be composed of all donor information. This includes: members,in-kind sponsors, board members, individual donors, volunteers, and artist donations. I created a spreadsheet that lists all past event and donor information. This will help Burnaway in their attempt to keep donors up to date with events and to encourage them to keep supporting their foundation. This will be an ongoing project throughout the summer. 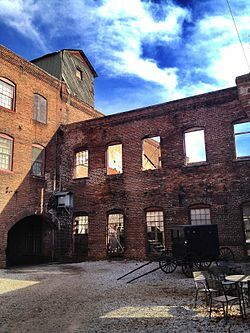 After I began the spreadsheet I was able to begin researching events in Georgia where Burnaway could potentially go and participate. This is really fun because I am getting a better sense of art festivals and events outside of the metro Atlanta area. Today was a really great introduction to what will be entailed for the remainder of the summer. I am so excited to have been accepted into this internship! I will have a new post weekly about my experiences and other happenings! I start on the 15th, so stay posted and enjoy! Every week I will be working for around 7 hours. I will continue my weekly updates until I have completed my internship hours.